In September, Headliner launched its new live music initiative, Headliner Helps, where a string of artists gathered for a day of live music to raise money for Jessie’s Fund – a wonderful charity that helps children with complex needs using the power of music, recognising that it is a brilliant tool for therapy, and aiding the communication of children. What better way to raise cash for such a cause, than with a cracking music festival? 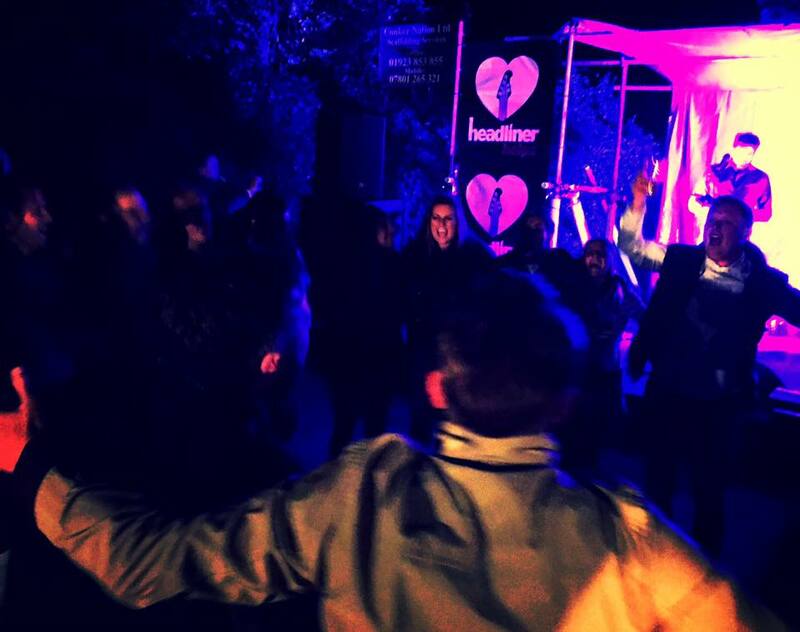 Headliner Helps was held within the grounds of The Six Bells in St Albans, an excellent old tavern in the stunning St. Michael’s village area of the city, opposite the historic Verulamium Park. So with the setting being perfect, all that was needed was some top of the range audio and lighting kit, and some excellent musicians. So where to begin? We’re well aware at Headliner that companies in the music biz are inundated with requests for charity events and freebies – and with that in mind, we threw all our manpower at this with guns blazing. If we were going to do it, we were going to do it right, kick it off with a bang, and create a real initiative that people would want to be involved in, and support. And thankfully, they did. Thanks to our musical friends and partners (big shout-outs to DiGiCo, JH Audio, DPA, RME, Harman, Audio-Technica, Lectrosonics, and Optocore) we managed to turn a pub car park into, frankly, a mini-festival. An enormous thanks to Yan Stile and the SSE team for providing an incredible PA system for the day, and also to Fly By Nite, for helping us lug this kit into the venue, and providing a truck driver that could drink more than The Six Bells landlord, which really does say something. "Now here’s a conundrum: can you actually fit a 10m x 3m stage into a pub car park? Remarkably, yes!" Now here’s a conundrum: can you actually fit a 10m x 3m stage into a pub car park? Remarkably, yes, if you get a four-man scaffolding team in to accommodate it at the very last minute(!) Another thanks to the remarkably efficient guys at Conker Nation, and hats off to the name, too, whatever it means. So with the infrastructure (I use the term loosely...) in place, it was down to our hard-working Headliner team to put it all together, spearheaded by our good friend, Rick Dickerson, who travelled half the country to be with us on the day, and offered his services for free. He got to work early morning, grafting to create a great stage setup, alongside long-time roadie and stage manager, and occasional Headliner editorial contributor, Colin Pigott. 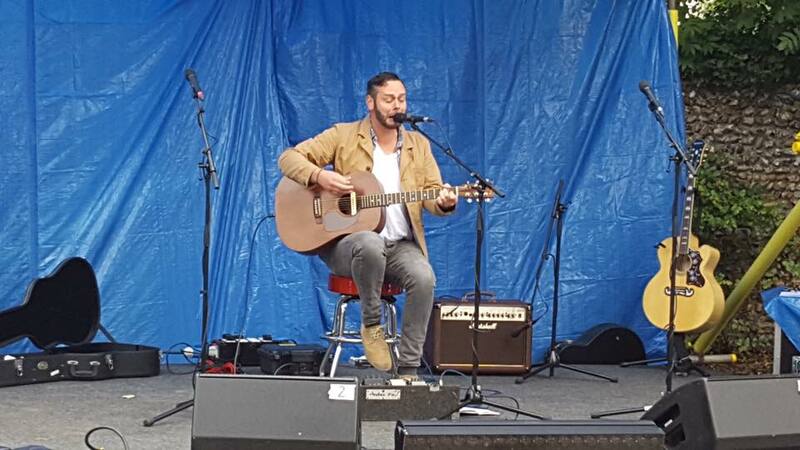 As St. Albans’ ancient clock tower chimed 3pm, we kicked off proceedings with the superb Mark Sullivan. 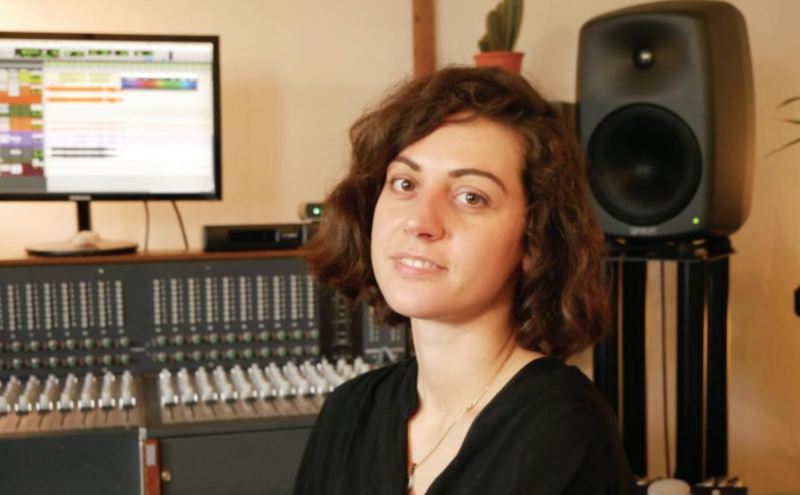 This Hertfordshire-born artist just got back from the US, where he cut his first record with New Jersey-based producer, Steve Greenwell, at Lakehouse Studios in Asbury Park, the hometown of Bruce Springsteen. And it was quick to see why. As brilliant an opening act as you could ever hope for – and with the most ‘gigged’ pedalboard we’ve ever seen - his huge voice soared beautifully through the DPA d:facto microphone and out of the rig, his effortless guitar playing complementing the vocal perfectly. Mark’s mix of original material and eclectic cover versions had the revellers spellbound from the get go; and a personal favourite had to be his rendition of Clapton’s classic, Layla, a mix of slowhand’s famous unplugged version, with his own wah-infused twist. A treat on the ears. Mark was followed by Roxy Searle, more proof of Hertfordshire’s thriving talent. Another great vocalist, who gave an excellent personal take on Beyoncé’s Crazy In Love and Bon Jovi’s You Give Love a Bad Name, weaving in some great original numbers, too. One to watch, we think. Next up, Ilona, a Bulgarian-born and now London-based singer-songwriter. She has also just returned from the States – Nashville, to be precise – where her latest single has been receiving plenty of US airplay. Ilona was backed by Tony Moore, one of the most hard working musicians on the circuit. The ex-Iron Maiden and Cutting Crew keyboard player looks after live music at The Bedford in Balham, London, one of the city’s finest musical hubs, and is no stranger to playing (and indeed founding) festivals. This time, Tony picked up the guitar to back Ilona, who opted for a set of original material, and with songs like That’s What a Broken Heart’s For, nobody was complaining. Her ethereal, husky voice also sounded stunning through the DPA mic, and her stage presence demanded attention. By 6pm, the crowd was really digging the whole vibe. The rain was just about holding off, so in between sets, we decided to grab a few minutes with stage manager, Colin Pigott, who’s busy restringing a certain Headliner editor’s acoustic guitar. Pigott went on to reveal some extraordinary ‘road tales’, one of which involved an incident with a large tub of Vaseline and a team of agricultural students in North Wales; the other, when he removed his own bootlace to create a makeshift guitar strap while said guitarist was playing a solo at a show. The rest should definitely remain unpublished. "Hopefully this will be the start of the Headliner festival; stranger things have happened!" Next up was Hertfordshire trio, ARC, made up of Anja, Cara, and Russell Rodford. They soon win the crowd’s affections, opening with a gorgeous version of Florence + the Machine’s Shake It Up, with a show-stopping a capella intro – brave, under these circumstances, but they nailed it. They follow it up with The Beatles’ You’ve Got to Hide Your Love Away, and entertain the masses for another 30 minutes, putting a smile on everyone’s face, including ours. (seriously). Her set included a very characteristic rendition of Bruce Springsteen’s I’m On Fire, and she won instant rapport with the audience with her Irish charms and larger than life singing voice. The onus was on penultimate performer, Emma Stevens, to keep things going in the latter part of the day, and the folk/pop singer did not disappoint with her lively set of mostly unique originals including Make My Day, which made use of her enchanting voice and ukulele talents. Not to mention a Jackson 5 cover, which she told us she had less than an hour to put together at a previous festival; and her touching version of Elvis’s Can’t Help Falling In Love also got the Headliner seal of approval. US Artist, Will Hawkins, closed this fantastic show. he also had the longest to travel - 6,000 miles to be precise, all the way from Santa Monica, CA! He’s a seasoned pro, and his country infused singer-songwriting was a delight to behold. Headliner’s editor joined him on stage to end things with a few more numbers - Oasis’ Wonderwall being the appropriate conclusion, as the crowd formed a huge circle, belting out Noel’s famous lyrics in various keys and time signatures. The Six Bells’ landlord was also onside, despite going three encores over the curfew. And based on the success of the music, the enjoyment of the attendees, and the enormous amount of money raised for Jessie’s Fund (£3,000), these should turn out to be wise words. Watch this space.